Do you ever look into a closet full of clothes and have a hard time finding something to wear? Personally, I sometimes spend almost an hour agonizing over what to wear, even though I have a closet chock-full of garments and outfits. Personally, I sometimes spend almost an hour agonizing over what to wear, even though I have a closet chock-full of garments and outfits. So, what exactly is it that causes this phenomenon? What makes us buy clothes, which we apparently like one minute, only to turn around in a week, decide we don’t love it, and insist we have absolutely nothing to wear? Not only are we obviously wasting our money on all the wrong things, but we’re also making our lives infinitely more complicated than they need to be. As a new year approaches, now is the time to set a goal to simplify your life by simplifying your wardrobe. Here are some ideas to help you simplify your closet for the coming year. While there’s nothing wrong with being a thrifty shopper, and more often than not I’d say being frugal is a good thing, there are moments when it’s better to invest in things rather than to buy what’s cheapest. When you choose to spend more on a few solid pieces of clothing, you’ll have a lesser need and desire to constantly be buying clothing. Moreover, you’re much more likely to mull over an item before purchasing if it costs more, as opposed to the moments when you grab five shirts that you might not love, but have to have because they’re on sale for cheap. Instead of having five shirts you don’t really want to wear when you look in your closet a few weeks later, you’ll have one fabulous top you’ll want to wear all the time. And of course, if you’re opting to purchase fewer but high-quality items, instead of an array of cheap items, your closet will instantly be less cluttered to begin with. Years ago, repairing your clothes was the thing to do. No one would have found one hole in their shirt only to turn around and throw it away. Well, neither should you. Not only will learning a few basic sewing and repair skills be good for you, but it’ll save you a lot of money as well. Sometimes, you might have to call a professional, but even that can be a lot cheaper than replacing an item entirely, so you’ll still be saving money. Furthermore, you’ll simplify your closet in the sense that you won’t run out and buy a new top at the first sign of wear, which means you won’t have a bunch of new clothing waiting in your closet to be worn while you’re still wearing out the old. 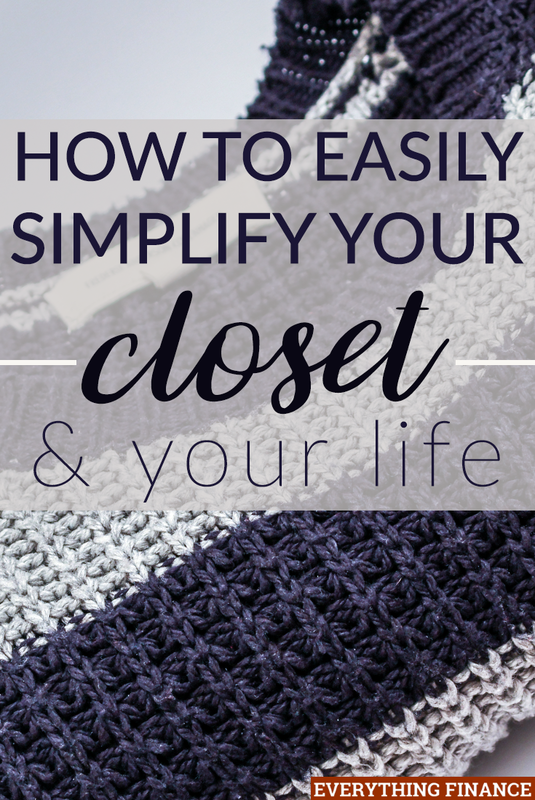 The first step to simplifying your closet is going through it and decluttering. This is one of those chores that we tend to put off, but once complete, your life will instantly feel less cluttered. Do you still love it? If you answer no to any of those questions, it may be time to pitch it. Another good rule of thumb to go by is whether or not you’ve worn a garment in the past six months to a year. If you haven’t, chances are you won’t wear it in the coming months either. Whatever you do, don’t allow yourself to rationalize why you need to keep every item in your closet, or you’ll be right back where you started but with a few hours wasted. Do you ever buy certain items like pencil skirts, six-inch heels, or way-too-tight jeans, which you insist you’ll wear, but never do? Some of us have certain items that we may try to wear, but really don’t work for us. For example, being 5’3’’ makes me feel as though I should love wearing heels. But, no matter how many pairs I buy, I find I usually don’t wear them. That being said, when going through your closet, purge any items you keep telling yourself you’ll wear, but never do. And to keep your closet simplified in the future, try to keep yourself from purchasing those items that you know just don’t work. You’ve probably heard of a capsule wardrobe, but if you haven’t, it essentially involves creating a small collection of about 30-40 clothing items, outerwear and shoes included, that you can mix and match easily. This helps you eliminate the array of items you barely wear down to a few key staples. Keep in mind that this doesn’t include accessories, fitness outfits, or those for special occasions. The trick to this is to keep things simple and purchase items within a similar palette so that you can create a variety of outfits with the items you have. By doing so, you’ll go from a disappointing pile of clothes to high-quality staples you wear all the time. Along with the capsule wardrobe, a good way to simplify your closet is to filter your clothes in and out by season. Instead of trying to fit all the seasons in one space, store winter items during the summer and vice versa. Things won’t seem as cluttered or messy when you’re only looking at one season at a time. Then, to keep things simple, before packing away one season’s items, go through them and get rid of what you didn’t wear so you don’t keep it through to the next year. Advertisements and clothing stores make you feel like you should have a closet stuffed full of clothes. However, more isn’t always better. Having too many options can not only seem overwhelming, but can lead you to buy things you don’t really love or need. Instead, use the new year as a starting point to declutter and simplify your closet. Have you simplified your closet? What are some of your tips to help simplify your closet?